Attention Lazy People! This is for YOU! (AKA, this is for me!) Master Formula is a super multivitamin, multi-mineral and multi-food supplement! There are 25 key dietary elements from Master Formula, with a minimum of 100% of the daily recommended amounts of 14 different vitamins and minerals. They call it the Master for a reason! This nutritional complex contains vitamins, minerals and food based nutrients to support overall health and well-being. NingXia Red is a whole food nutrient that contains powerful antioxidant fighting properties. Antioxidants help to fight off free radicals which can break down your system. Antioxidants: another word for you to Google! Overall wellness and nutritional support is key and the mainstay of this delicious tasting supplement. It is recommended you take 1-2 ounces daily. NingXia Red is formulated from exotic fruits such as the NingXia Wolfberry and is infused with essential oils. This wonderful supplement supports normal cellular function, eye health and prevents deterrents due to oxidative stress. Fortify, Energize and Revitalize are the key words that come to mind with Ningxia! What is a Wolfberry? Wolfberries (aka goji berries) are super high in antioxidants and so good for you. In fact - they have an ORAC (Oxygen Radical Absorbance Capacity) value of 25,300! (In comparison, blueberries have score of 2,400.) If that’s not legit, I can’t say what is! That’s a whole long list of good. Okay, remember the issue with supplements? Taking them? Well here’s another that you just can’t afford to skip: Multigreens! Fun YL fact: Gary Young was first to add essential oils to supplements! Get this- clinical experience has shown that before putting essential oils in the MultiGreen formula, there was 42% blood absorption in 24 hours. After adding the essential oils to the formula, blood absorption increased to 64% in 30 minutes and 86% in one hour! The conclusion was that the cells were now receiving nutrients that they had previously not been able to assimilate! How cool is that? MultiGreens really packs a powerful punch for a supplement. Get your daily source of greens in this bioactive sea vegetable energy source for vitality. The combination of bee pollen and essential oil blend helps to increase assimilation of the nutrients with an excellent choline source for energy production. This power packed supplement supports the nervous system, cardiovascular system, and the hormonal glands of the endocrine system. It contains 5 green superfoods including alfalfa, Siberian ginseng, barley (super nutrient rich food with vitamins, minerals, amino acids and fiber. ), kelp and spirulina (a single tablespoon of spirulina is equivalent to 4 grams of protein (that’s like eating an egg!). 🐝Bee pollen is part of this supplement as well and is a great source of protein, vitamins and minerals. (If you can get local bee pollen, you can add it into your yogurt, yummy and so so good for you!) It’s also high in protein and loaded with vitamins and minerals! Rosemary - can support healthy liver function. Melissa - strengthening, cleansing, and revitalizing and can help to support the immune system. Lemon - energizing and supportive to the circulatory system, also a great supporter of the liver! Lemongrass - is purifying and supportive to the digestive system, also great for supporting healthy skin. Looking for a great non-dairy calcium source? OR any Calcium source for that matter? Young Living's MultiGreens capsules contain barley grass, which offers 11 times more calcium than an 8-oz. glass of milk. That’s crazy awesome! Probiotics are so in right now! What exactly is a probiotic? These trendy probiotics deliver the “good” bacteria back into your digestive system to keep things working optimally. There are many varieties of probiotics on the market today and there are also a wide variety of qualities. When using a probiotic you want to be sure the probiotic is made up of an active or live strain! Life 9 comes as a delayed release capsule designed to bypass the stomach and deliver the probiotic to the lower digestive tract. The culture count matters as well and Young Living’s proprietary blend contains 17 billion which means 17 billion live beneficial cultures per serving byassing the stomach improving overall efficacy of the probiotic. That’s a lot! But WHY do we need to use them? Probiotics can help your digestive system absorb more nutrients which is key to maintaining your health. We are learning more and more that the gut plays a HUGE role in optimal health. 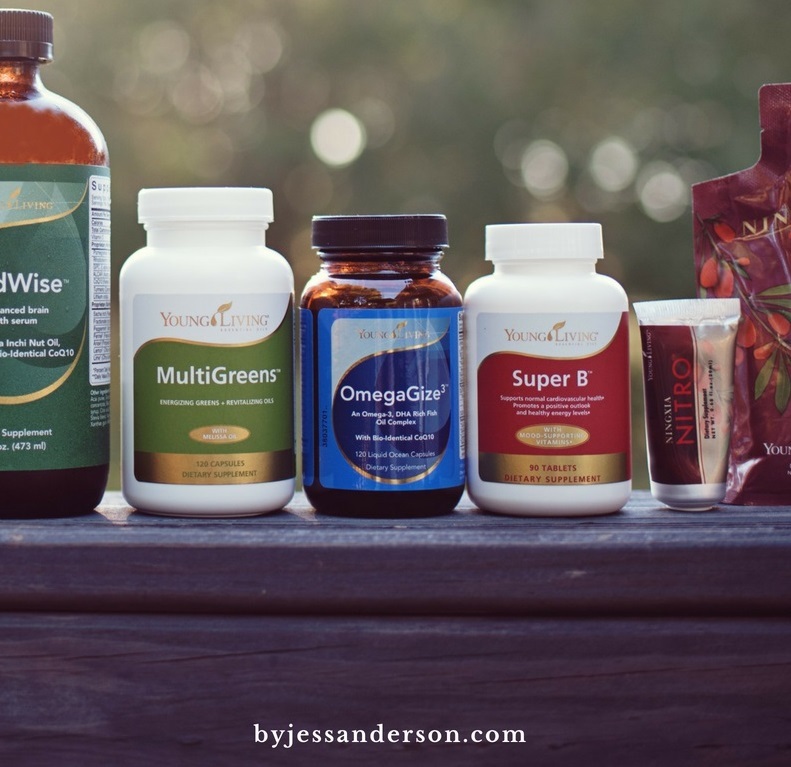 Supplementation may be helpful to assist the body to support every organ system. Good absorption + the ability to remove toxins = a healthy gut. Two thumbs up! Probiotics also support normal elimination, which also gets a thumbs up! This supplement contains omega 3 fatty acids (DHA rich fish oil), Vitamin D3 and CoQ10. This combination can be used daily for your wellness regimen. The ingredients are excellent and work together to support normal brain health, cardiovascular health, eye health and joint health. Everyone can benefit from this supplement! Basically, if you’re looking to maintain a normal level of well being, mental clarity and focus, added support for normal cardiovascular function, and additional joint support this is for you! OmegaGize is also infused with Young Living essential oils including German Chamomile and Spearmint. Why do we need omegas? When it comes to fat, there’s one type you don’t want to cut back on: omega-3 fatty acids. Two crucial ones — EPA and DHA — are primarily found in certain fish. ALA (alpha-linolenic acid), another omega-3 fatty acid, is found in plant sources such as nuts and seeds. Not only does your body need these fatty acids to function, but also they deliver some huge health benefits. What about Vitamin D3? Did you know that we have a Vitamin D deficiency epidemic? With all the concern with skin cancer we load up on sunblock/sunscreen and don’t get nearly enough exposure to the sun. Have your blood levels drawn with your healthcare provider to check your levels. Having adequate levels of Vitamin D is shown to reduce many risk factors. Most multivitamin supplements only contain 400 IU of Vitamin D. This is not enough to increase your stores! CoQ10 is an antioxidant made found in our bodies and is needed for basic cellular health. Having the proper amount of CoQ10 is crucial to muscle health too. That’s it! Why wolfberry powder? MSM needs certain nutrients to be assimilated into our body and cells...and just so happens wolfberry contains them all! For dietary sulfur to be metabolized efficiently, the proper calcium amounts must be present. And remember that is takes magnesium to metabolize calcium! Ninxgia wolfberry is added to Sulfurzyme for this reason. The benefits of wolfberries are amazing. They contain 21 trace minerals, 18 amino acids and many vitamins. It is a significant source of minerals and coenzymes that support the assimilation and metabolism of sulfur. Everyone needs sulfur to live. If you are depleted of the sulfur you need, then your ability to detox goes way down! Sulfur is our main weapon for detoxing! Sulfur makes up our hair, skin, nails and is also key for rebuilding the myelin sheath around our nerves. The nerve sheath gets eaten off by toxins and heavy metals and we need sulfur for nerve communication! Sulfur also equalizes water pressure inside of our cells which supports joint health, our immune system, our digestive system and our cardiovascular system. If you have super sensitive skin and tend to detox through the skin, then SulfurZyme should make it into your daily supplement regimen for sure! It is safe for human and animal use; and is also available in a powder form which is great for your pets. With the powder, you can place it right on their food and they eat it right up! And get all the benefits of essential oils and more! HOLD THE PHONE. Did someone say skin and hair? You mean, my crappy post-baby skin, and receding hairline can benefit from this supplement? Say no more. Sold. This is an awesome supplement to take as part of your nighttime routine, riiight as you go to fill your bedside diffuser with sleepy time oils. Immupro is a blend of some of the most potent immune supporting ingredients all wrapped into one delish fruit-flavored chewable. This one tablet can help fight the effects of oxidative stress on the body. Oxidative stress is when the body has too many free radicals. Free radicals are unavoidable and in excess can cause damage to the body. Pollution, second hand smoke, herbicides, and even our own immune systems produce free radicals. The key to keeping things balanced is an antioxidant. Antioxidants are able to neutralize the free radicals. Immupro delivers the antioxidants in the form of wolfberries. If you haven’t already heard, wolfberries are off-the-charts-incredible for anyone wanting antioxidants. It also contains a teeny bit of melatonin to support healthy sleep! We all know good sleep is needed to restore and prepare the body for the next day. It also contains calcium, selenium, zinc, and and copper to support the immune system. How do I use ImmuPro? Chew 1 tablet before retiring. Kidscents Mightyvites: Dude. These are the best vitamins for children on the market! There are no artificial dyes or chemicals like other brands we previously used. (Think Flintstones gummies that are loaded with RED DYE. Gross.) Check with your doc on dosage for your kiddo. How To Use: Children 6–12 yrs old, take three chewable tablets daily. Can be taken before breakfast, lunch, and dinner, or in one daily dose. Kidscents MightyZymes are an all-natural, vegetarian product in the form of chewable tablets designed to help children combat the negative effects of of enzyme depletion. MightyZyme chewables address each of the digestive needs of growing bodies and assist the normal digestion of all foods, including proteins, carbohydrates, and fats. I don't know about you but I like the sound of that! Why are these important you ask? In short, even the healthiest diet is useless without enzymes. Enzymes are substances that make life possible! They are needed for every chemical reaction that takes place in the human body. Vitamins, minerals, nor hormones can do any work without enzymes. This is why enzyme depletion is concerning, and why it needs to stop; starting with our own families. So...defend those sweet systems with a flood of healthy enzymes! Lots of kiddos drink 1 oz of Ningxia a day! Sometimes I mix it with water most days, other days let him drink it straight, and other days we make popsicles! Directions // Place ingredients in blender and blend until smooth. Pour into molds, freeze, and enjoy! If you don’t have popsicle molds handy, simply use small dixie cups and popsicle sticks ;) You could also use plain or flavored Greek yogurt for an additional health boost. 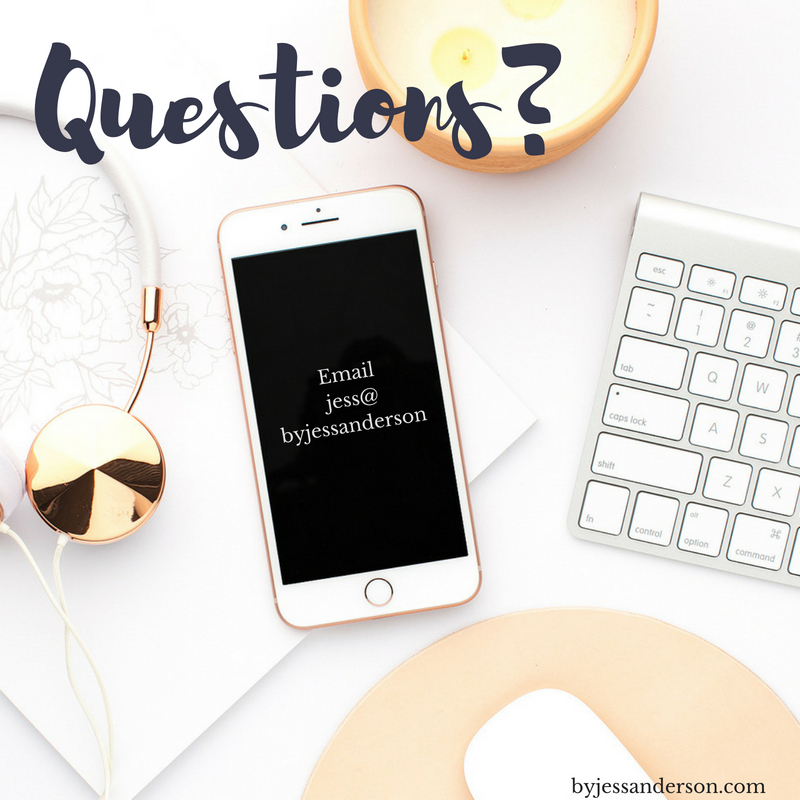 I am so glad you're reading this post and you're soaking in all this awesome info about Young Living’s supplements!!! If you’re ready to jump in and give some of them a try. Here you'll find step-by-step instructions on how to purchase high quality essential oils and supplements from the only company I trust! I’d love to hear which supplements you’re most excited about adding to your daily routine or what you're already doing. Please comment below. Happy supplementing! Keep reading for more information on all ALL the supplements available and what they can do for your wellness. Let’s get this straight. I am not a doctor and not a member of the FDA. I am part of a group of oil lovers who think it’s important to do your own research, consult your doctor, and use your best judgement when it comes to what you put in and on your body. In addition, Young Living products and information regarding Young Living products have not been evaluated by the FDA. None of the information in this blog post is in any way meant to take the place of medical advice. It is for educational purposes based off opinions and facts that we have found to be true in our own experience and with research we have gathered from books and online. No one from our group is diagnosing, treating, or prescribing. If you have any health conditions, are on any medications, are being seen by a medical professional for any reason, are elderly, pregnant, nursing, have babies or young children or animals please consult your physician or veterinarian as well. All information, content and product descriptions contained within this event are for reference purposes and are not intended to substitute advice given by a pharmacist, physician or other licensed health-care professional. We do not advise you use the information contained within this website, or any other site for treating a health problem or disease or to make a self-diagnosis, without talking to your doctor. Actual product packaging and materials may contain different information than shown on this website. Contact your health care provider immediately if you suspect that you have a medical problem. Safety is of utmost importance when using essential oils, of course! It’s easy to get overwhelmed with all of the information out there; but using common sense and starting gradually will help ease any sort of intimidation you might feel as you begin using essential oils in your everyday life. We recommend picking yourself up a reference guide of some kind. Our favorites are found at www.discoverlsp.com and you can also grab them on Amazon. Young Living’s' purity and grade is extremely high (which is why I love them! ), so they should be used with knowledge and respect. I also ONLY recommend using Young Living Oils and cannot recommend or speak to using any other brand. 1. When storing essential oils (EOs), it’s important to keep them in a cool, dark place with lids tightly closed (and ALWAYS out of reach of children). You’ll also want to keep carrier oils (for example coconut oil, jojoba oil, olive oil, vitamin e oil, sweet almond oil, etc.) on hand for dilution. Always use and store EOs in glass containers, especially when drinking them in water, since most plastic products contain chemicals that can be easily broken down by the oil. 2. Most EOs are generally safe for use during pregnancy, but need to be used with common sense. As with any health program, you may want to consult a healthcare professional beforehand. A couple great resources are the books Gentle Babies and Aromatherapy for the Healthy Child. 3. Citrus oils cause photosensitivity when applied to the skin. They may cause a rash or dark pigmentation on skin exposed to UV rays or direct sunlight within 8-10 hours after application. 4. Keep EOs away from eyes and never put them directly into the ears. 5. Should irritation or accidental contact with eyes occur, never use water to clear the EO (they are not water-soluble). Instead, use a V6 vegetable oil complex or other carrier oil (such as coconut oil or sweet almond oil) to cleanse the area and reduce discomfort. 6. Epileptics and people with high blood pressure should use extra caution when using EOs high in ketones like basil, rosemary, sage, or tansy. For people with allergies or sensitive skin, it’s best to test a small area (like the inside of the upper arm or bottom of the foot) and wait 30 minutes before applying to other areas. In general, the bottoms of the feet are safe for topical application. 7. Direct inhalation (*Not the same as diffusing) can be a deep and intensive application method, particularly for respiratory congestion and illness. This method should not be used more than 10-15 times throughout the day without first consulting a healthcare professional. 8. When adding EOs to bath water, start with 1-3 drops first mixed with Epsom salt to help disperse the oil. Never use more than 10 drops in one bath. If a dispersing agent is not used, serious discomfort can be caused due to the fact that oils tend to float undiluted on top of the water. 9. Young Living states right on the bottle if an oil can be consumed as a food additive or “dietary supplement.” Please DO NOT use any EO internally that is not specifically indicated for that purpose. 10. Application of oils on children is not recommended until after 6 months of age, and must always be heavily diluted. Start with the bottoms of feet before applying to other areas of the body. Again, the book Gentle Babies is an incredible resource to learn more on EO safety in pregnancy, while breastfeeding, and with children. Diffusing around babies and children is, however, the safest route. OilyNotebook.com has a convenient dilution calculator to help you figure out a good dilution! Gold star if you made it all the way through. It’s important! Hello! I’m Jess – I’m a small town Oregonian, a scientist, and a crunchy mom. Passionate about essential oils, long distance cycling, cooking with my littles, cashew milk ice cream + margaritas (on the rocks - salt, please!). My purpose is to help people and nature, both in my professional career and in my personal life. I have spent my career helping bridge the gap between commercial development and preserving nature. Essential oils have become my way to do the same between all the commercial products in our home and creating simple, products on my own. 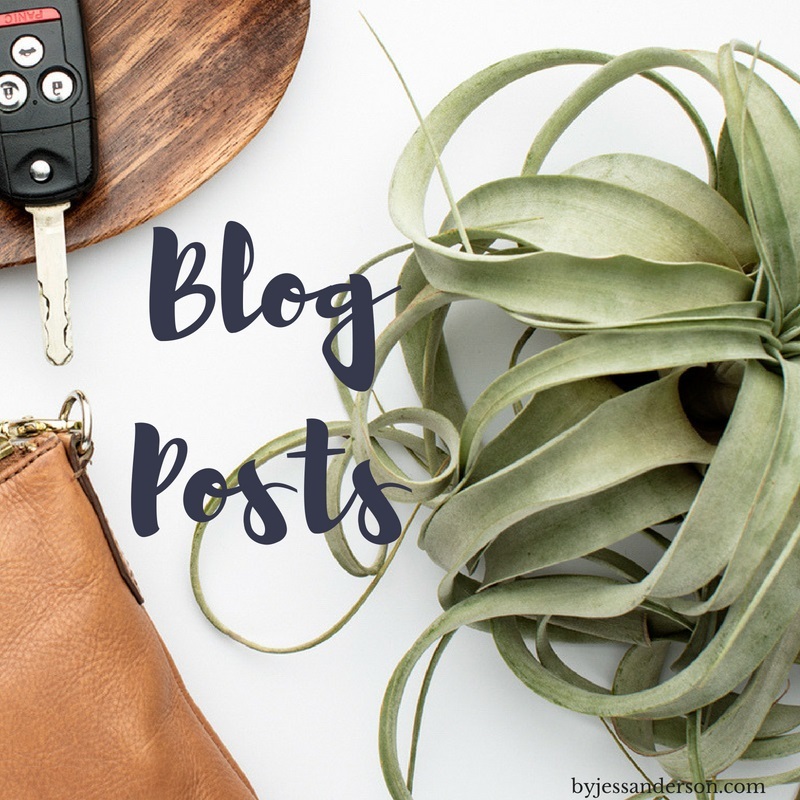 This blog shares my journey to a more natural lifestyle using essential oils, including the science behind essential oils, DIY recipes, tips, and ways to save money using plant-based alternatives. 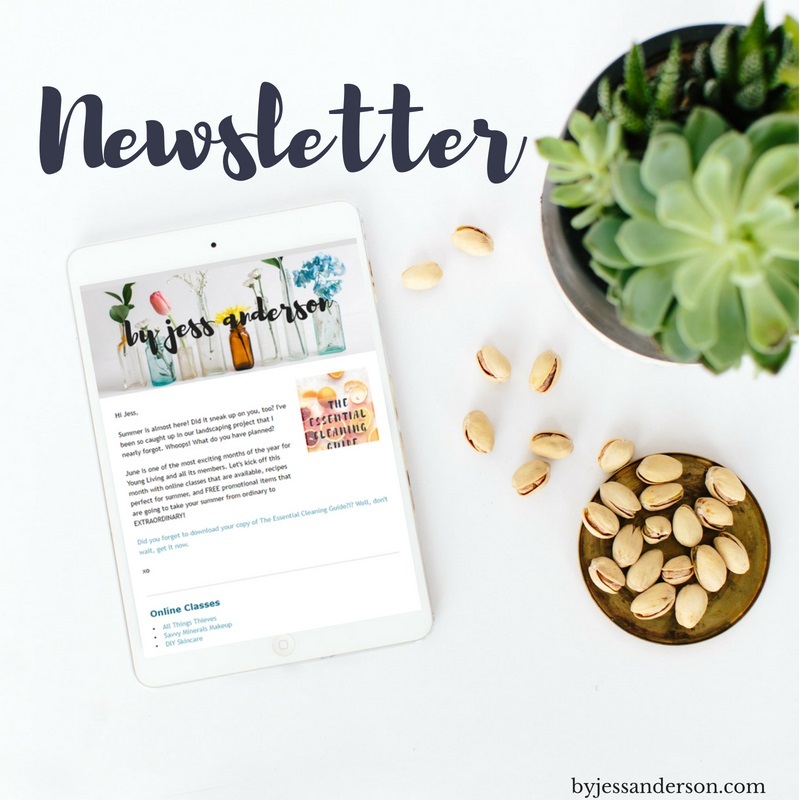 Check out my free email course ditch + switch – natural living with plant based products and learn the steps you need to take to kick those toxins to the curb. I am not a doctor. I am not here to diagnose, treat, or cure any of your illnesses. The content I share is for informational purposes only.